Imagine an IT contract negotiation. One party asks the other to indemnify and defend it against certain suits by third parties. Maybe it’s a customer asking its vendor for an IP indemnity. Or maybe it’s a distributor asking its supplier for an indemnity against product liability suits. Either way, the party receiving the request says, “OK, but only if the suit’s our fault–and only if you indemnify us against suits caused by your fault.” That sounds fair, so the requesting party agrees, and the two draft a two-way or “mirror” indemnity. The clause says the party at fault for the third party suit indemnifies and defends the other party. And everybody’s happy, right? Not if the indemnity clause actually gets called into action. Let’s say the feared lawsuit happens: a third party plaintiff sues one of our parties or both. Which of our parties has to defend the other? The mirror indemnity clause says whoever’s at fault defends. But we don’t know who’s at fault, if anyone, because the suit just started. The court won’t decide fault until the end, if ever. And it’s not like we can look at the plaintiff’s complaint to tell us who’s at fault. Whether the plaintiff accuses both of our parties or only one, both will almost certainly deny any wrongdoing. (Surprisingly few defendants or potential defendants fall to their knees and confess.) So what happens? Each party demands that the other defend it per the indemnity clause, and instead of cooperating against the plaintiff, they probably end up suing each other. In other words, it doesn’t work for each party to indemnify the other for the same type of suit, with fault determining who actually bears the burden. At least, it doesn’t work if the indemnity clause includes a defense obligation, which is typical in IT deals. Defense obligations kick in at the start of a lawsuit, but you don’t know who’s at fault until near the end, when the court rules. In most IT deals, defense is the central plank of the indemnity clause. One party wants the other to hire lawyers and defend it against X, Y, or Z type of lawsuit. A distributor wants its manufacturer to defend it against product liability suits. A customer wants its vendor to defend it against patent suits about the vendor’s products. An IT vendor wants its customer to defend it against data leak suits by the customer’s users. Etcetera. In each case, the parties agree in advance that indemnifying party will take the costs, uncertainty, and other burdens off the other party’s shoulders. Well, that doesn’t work–you don’t remove the uncertainty–unless the indemnitor agrees to defend the suit whether or not it denies fault. No one has to accept that obligation, though it may be a cost of doing business with the other party: take it or leave it. If a contracting party accepts the burden, it’s usually because the type of suit in question feels like a natural cost of its own business, but not of the other party’s business. Companies that license IP, for instance, often agree to defend IP suits about their products whether or not they’re liable–whether or not they’re at fault–because IP is their business, not their customer’s. And manufacturers agree to defend product liability suits against their distributors–regardless of fault–because product safety is the manufacturer’s business, not the distributor’s. A mirror indemnity defeats the point. Instead of creating certainty by determining in advance who defends a suit, a mirror indemnity says either party might have to defend, depending on who’s at fault. That almost guarantees that neither party will defend the other because neither will accept fault. A mirror indemnity could work if you leave defense obligations out. Then the parties could wait until the end of the suit to see who the court blames for the loss in question (if anyone), and that party can pay any judgments and maybe even reimburse the other’s defense costs. Of course, when you’re drafting that sort of clause, you have to figure out what happens if the case settles before a court rules on fault. But that won’t work if defense is the number-one goal of the indemnity, as in most IT deals. So in most IT contracts, mirror indemnities don’t work. 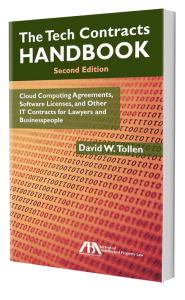 The Tech Contracts Handbook, 2nd ed., addresses indemnities in Chapter II.J — including mutual indemnities in Subchapter II.J. 5. © 2011, 2016 by David W. Tollen. All rights reserved.